It’s hard to pinpoint exactly when your parents stop being just your parents, and become something a little bit more. If you’re anything like me, it happened around the same time that you started seeing little bits of Mom and Dad in your everyday motions and movements, in the little things that ultimately make you who you are. As funny as it may sound, I first noticing these niggling bits of my parents in me when I adopted my cat, Suzie. I would, and still do, run back home after leaving for work to make sure – for the umpteenth time – that I did indeed turn off my hair straightener, lock the door, or put away all the sharp knives. Yes, it’s part OCD, but it’s also done out of love, because I know I’d never forgive myself if something were to happen to my little furry baby. And because of this, I’ve now gained a new respect for my mom, who countless times throughout my childhood, would turn the car around not long after we left home so she could make sure her curling iron was off. It was annoying and frustrating at the time, but now I feel like it’s a common ground, shared between two very close friends. My dad and I are two and the same – from the way we bob up and down when we walk to the way we always reach behind the product we want on a store shelf to select the second package in the row. It’s in the way we obsessively fixate on the most benign things, to the point where we bite our nails nervously while standing in front of our dressers every morning trying to decide what to wear. I’ll admit, these were once things that I teased my dad for doing – my teenage self likely made the occasional snarky comment when he refused to grab the first box of rice on the shelf at the supermarket. But now it’s just another quirk that I share with my dad, another reason to laugh when we catch each other doing one of these ridiculous things. Now, where I once saw two authority figures in my life, I see two people whose words I covet and whose arms I seek the deepest of comfort in. They’re my parents, yes, but they’re also my friends, the people who I know I can always depend on, who see through any facade I try to present and always demand the truth from me. And I think the real defining moment, when the relationship really started to blossom into what we have today, was when I realized that this dependence and comfort isn’t one-sided. I’m starting to see that just as much as I long for and need my mom and dad, they also lean on me, and depend on me, just like close friends. I found this recipe in my grandmother’s archive of goodies. 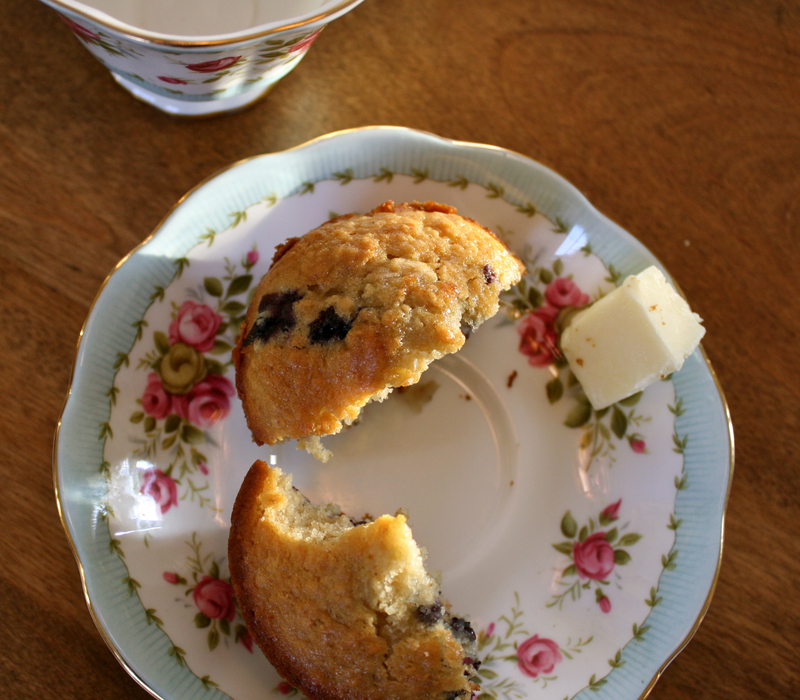 I’ve long been a fan of blueberry muffins, and the combination of gooey rolled oats and creamy buttermilk bring these muffins to the top of the recipe pile in my kitchen. 2. 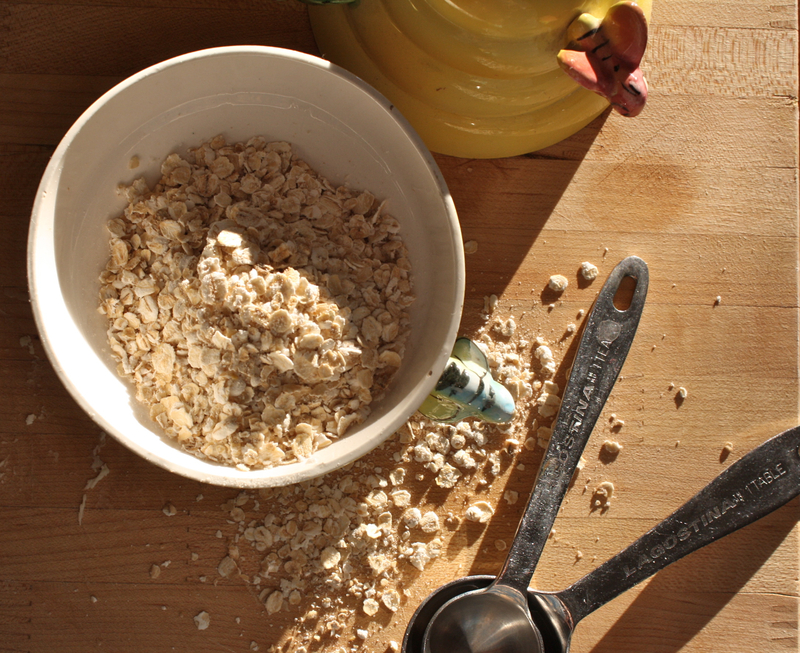 In a medium bowl, combine oats and buttermilk. Let stand until needed. 3. In a large bowl, whisk flour, baking powder, baking soda, salt and sugar until well combined. With a spoon, stir egg and butter into oat mixture and mix well. Add oat mixture to flour mixture all at once and stir until just moistened. With a rubber spatula, gently fold in blueberries; do not overmix. 4. Pour batter into greased muffin tins, filling each cup 3/4 full. Bake on middle rack for 15 to 22 minutes, until a toothpick comes out clean when inserted in center. Remove from oven and let cool in tin for 5 to 10 minutes. Remove muffins from tin and let cool completely on a wire rack. Keep the stories coming along with the wonderful receipes. I enjoy each and every one. Thanks for sharing. Yum! A great way to use up those old fashioned oats I bought a few months ago. I thought they looked so beautiful that I couldn’t leave them on the shelf… but then I couldn’t find a fitting recipe. Thanks!